The spine doctor recommended me to do an EMG (ElectroMyoGraphy) test. I was unusually nervous (if you'll forgive the pun) beforehand, partly because I'd read something on the internet (not a good idea) that gave the impression the test itself would be horrendous, and partly because the results of this test would largely determine whether I would have to undergo surgery or not. The test is designed to detect nerve damage and consists of inserting needle like probes into particularly sensitive parts (in my case) of the arm. In a relaxed state, the oscilloscope should show a flat line with no noise and, when the muscles are activated, it should be plain to see. By the way, it was nothing like as unpleasant as I was expecting, a doddle really. The nurse told me that I was "como un pollo" or, that's what I thought she said, until I looked it up on the aforementioned internet. What she must have said was "estás como un toro" - I am like a bull or, in other words, there's nothing wrong with me. The doctor was slightly less enthusiastic and explained that there was very light nerve damage, but that surgery was not on the cards (yet) and there was every reason to believe that the nerves would repair themselves, with the help of a vitamin B1, B6 and B12 supplement. Next step is to go back in three weeks' time, to see how things have been progressing. I am still pretty optimistic but it is a bit like watching paint dry or hair grow. I think the symptoms are getting better when I compare myself to a week ago, but from day to day it is a bit up and down. My home alone physio sessions are getting longer and longer as Mónica includes more and more exercises, but I believe that they are helping. In other news, I was going to the gym the other day to do my uninspiring workout of 40 minutes on the elliptic machine (without arms) when one of the monitors proposed for me to join in the special activities going on outside. 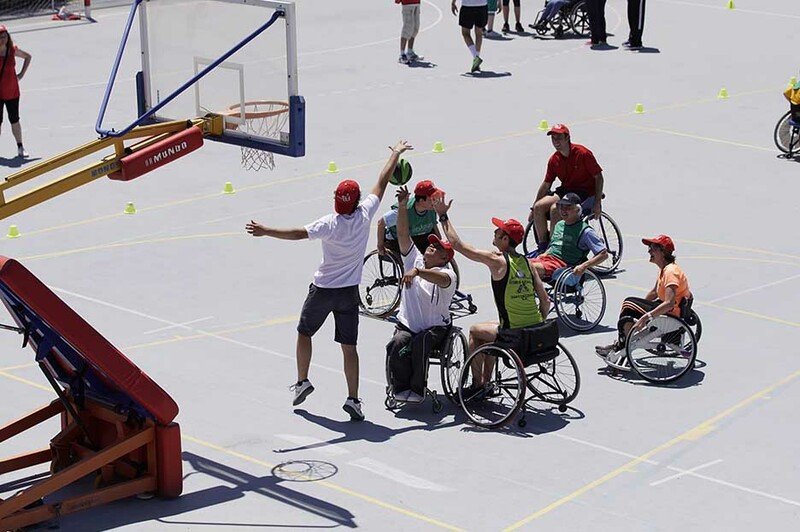 I had the chance to see what it was like being in a wheelchair - in particular, playing basketball in a wheelchair, something I am so bad anyway at that the wheelchair didn't make much difference. It was a lot of fun, especially seeing how people who are unable to do things that I take for granted were able to enjoy the simplest of pleasures.